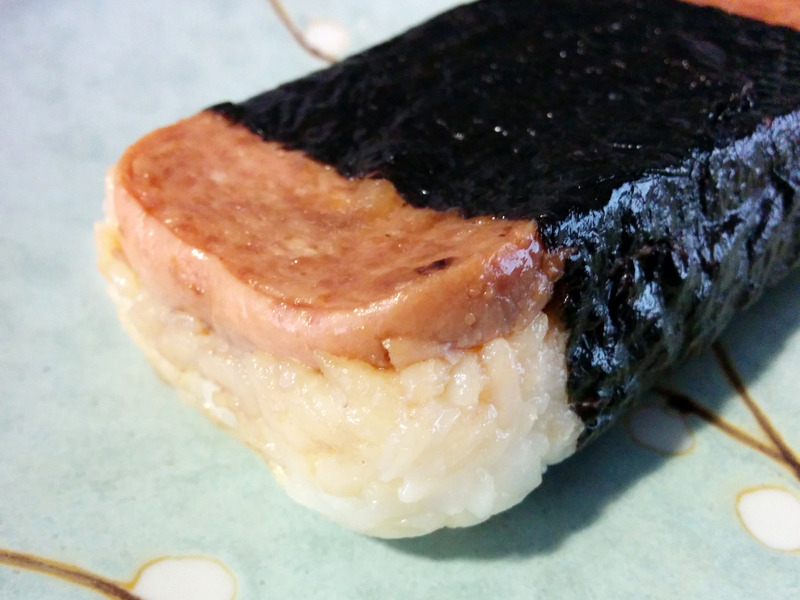 Over 5 years after our honeymoon in Hawaii, I’m recreating one of my favorite discoveries of the trip: Spam Musubi. We picked some up in a convenience store near the volcanoes and it was an unexpectedly good breakfast. It was also the first time I’d ever eaten Spam. Though we had plenty of fresh fruit, raw fish, and other delights, this portable snack stuck in my mind. When individually wrapped in cling wrap, these are perfect on-the-go snacks or work lunches. The one in the photo below might be a bit worse for the wear after a trip to work in my bag, but tasted great and held together well. Makes 10. Adapted from several recipes. Rinse the rice in a strainer or colander. Combine with water in a medium saucepan. Bring to a boil, reduce the heat to low, cover and cook for 20 minutes or until rice is tender and water absorbed. In a small saucepan, combine the rice vinegar, oil, sugar and salt and stir until the sugar and salt are dissolved. Stir into the cooked rice and continue stirring for a minute or two until the rice is glossy. Slice Spam lengthwise into 10 slices. This sounds difficult, but just cut in half first, then cut each half into 5. It’s easy to cut. 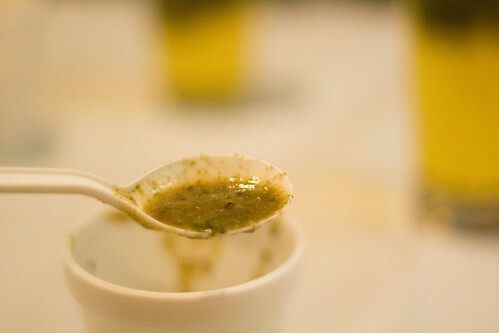 Stir together soy sauce, oyster sauce, and sugar until sugar is completely dissolved. Brush sauce on both sides of Spam slices and let sit for at least five minutes. While it’s marinating, saw out the bottom of the Spam can with a box cutter and fold over the edges so they’re not as sharp. Or, if you’re civilized (I’m not), you might own a musubi press. Heat oil at medium high in a large cast iron skillet. Cook slices until lightly browned; no need to wipe them off, just make sure they don’t burn. If you’d like, you can brush Spam with any leftover marinade after browning. Cut seaweed sheets in half (for complete coverage) or thirds (for a narrower strip). Put a strip of seaweed on your work surface, then the spam can on top, with an opening on the bottom. Press a handful of rice into the bottom of the Spam can from the top, then top with a slice of Spam, and press down on the spam. Gently remove the Spam can and wrap one side of the seaweed strip around the rice and spam. Dip your hand in a bit of water and wet the remaining length of the seaweed strip, then complete the wrap. The water helps the seaweed stick to itself. Wrap individually pieces in cling wrap if you’re not going to eat them right away. For the past few years, I’ve looked at the calendar the night before Mardi Gras and swore that the next year, I would remember to invite people over for a dinner party. This year we finally did. This was a low-stress meal. The jambalaya comes together in under and hour and requires no fussing or fancy plating; I did the chopping ahead of time and started cooking while we drank cocktails and ate snacks. 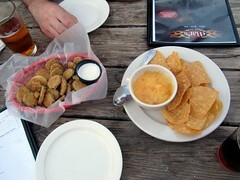 Our guests brought a ton of oysters and a pitcher of hurricanes. Muffaletta Spread – mix prepared muffaletta olive salad into cream cheese to taste. Serve with crackers. 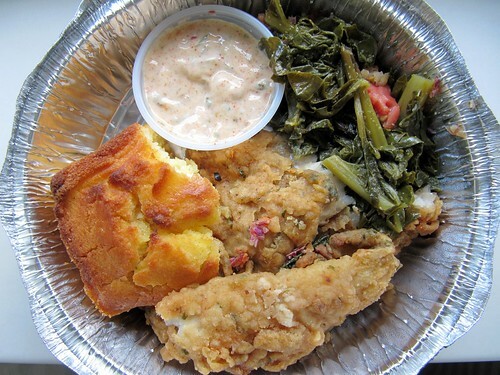 We were in Charlotte, North Carolina for a few days and I got to try some BBQ, soul food, and other southern specialties. Hungry after a breakfast-less morning flight, we started our first day with an early lunch at Mert’s Heart & Soul, where I had fried whiting (fish) with collards, okra/tomato, and cornbread. I was lucky our hotel (the Marriott Residence Inn – highly recommended!) had a kitchen with full sized fridge because I could already tell that the portions in this city were large. The image above is just my leftovers, which I gladly carried around until check-in time. 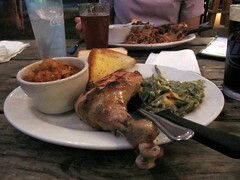 The internet seems to think that there’s no good BBQ in Charlotte but I thought the dinner we had on our first night, at Mac’s Speed Shop, was pretty damn good. We didn’t rent a car, so we took the Lynx (light rail) to get there – we probably could have walked, but it was getting late. A bonus was that Thursday night features North Carolina drafts for $3.50, and their beer list is large. 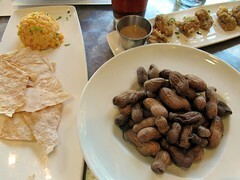 I tried my first ever boiled peanuts (left) at the not-for-profit King’s Kitchen, and I’d also never had pimento cheese before this trip – pictured left at King’s Kitchen and above in a creamy dipping version at Mac’s. I was under the mistaken impression that NC didn’t have regional hot dogs, but I was wrong. This one is from Green’s Lunch, a cute older hot dog spot near our hotel, and has mustard, ketchup, slaw, and chili. I ordered it “all the way” just like we do in Rhode Island. The next day for brunch we couldn’t stop ordering food – luckily there were three of us to share. 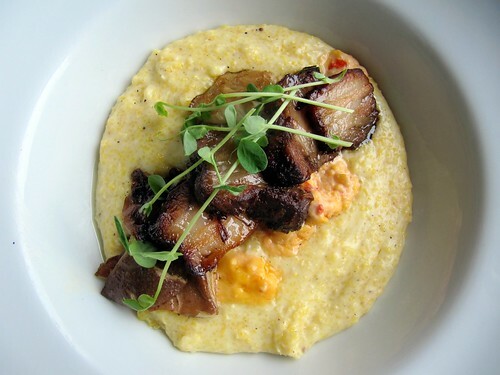 My grit bowl, above, came with a choice of toppings – I went for maple griddle pork belly, pimento cheese, and roasted cottonmill mushrooms. I wanted to crawl into the bowl instead of going back to the airport. Later, when I did, I had to keep a close eye on the TSA agents to make sure they didn’t make off with our leftover honey-glazed blackberry-buttered cornbread. What we loved about this restaurant was that despite serving up some of the most amazing food we’ve had, it didn’t take itself too seriously; on the other hand, the whimsy of the menu also wasn’t contrived. If you haven’t heard of Urban Greens, it’s a group of people (around 330!) who are working to start a cooperative food market in Providence. Even though the market is not yet open, you can order food through the buying club, which has been active for over ten years. I have an confession to make – even though I was on the board of Urban Greens for a couple of years, this month was my first time ordering from the buying club! 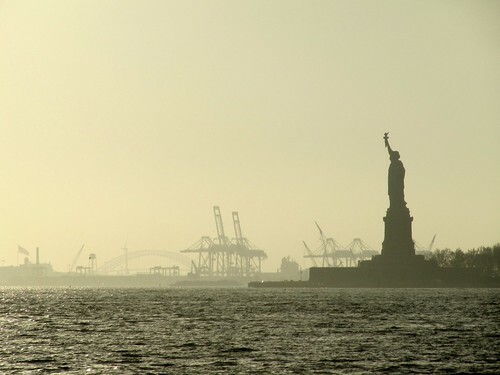 Previously, the buying club had separate membership fees, but now all member-owners of the future co-op (a 1-time payment) can order through the buying club at no additional charge. What can you order? Items from two catalogs – a catalog of local goods, and the Associated Buyers catalog which has natural, organic, and international products. Individual products can be ordered a la carte, and bulk goods with ordering minimums can be split by co-op members using a convenient feature on the website: you can indicate how much of a bulk order you want (for example, 5 pounds of oatmeal), then other members will see the split and can add their order to it. The catalog includes not only food, but also natural body products, cleaning supplies, vitamins, and more. How does it work? The order is placed once a month, and pickup is the following week. You can volunteer for only 1 hour a month to get the goods exactly at wholesale catalog prices, but if you choose not to, you pay a 10% surcharge (I’m pretty busy these days, so the 10% is still a good deal). What I ordered: A very small order to start, and easy to bike home. Both of these were a lot less expensive than they would be at the store. How can you join? More information about Urban Greens is available at http://urbangreens.com. I recommend becoming a member-owner of the co-op instead of just the buying club (haven’t you always wanted to co-own a store?) Joining is a one-time payment of $160, but you can also pay $40 a year for 4 years. If you love food and think about it a lot (as I do), you’ve probably thought back to your early food memories. Those times you tried something different, something that imprinted you because you loved or hated it. 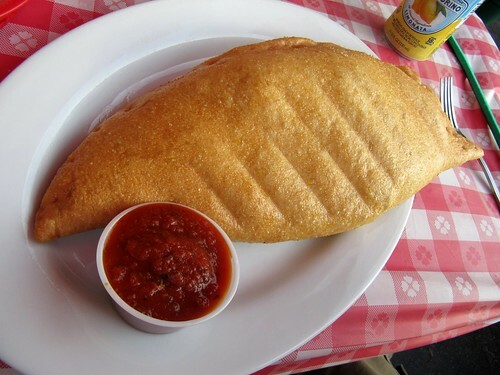 I grew up eating a lot of great food, but for some reason one of my strongest first food memories is a deep fried calzone. I was probably about eight years old, and my parents and I were sitting in New York City at a tiny outdoor table in front of Sal’s Pizza, off the Bowery. I remember how crispy the crust was and how the cheese oozed out as soon as I cut in. I remember how hot it was, and yet how I couldn’t stop eating. Lucky for me, my husband discovered a delicious source of fried (and non-fried) calzones in Rhode Island – Napolitano’s Brooklyn Pizza. It’s a small but welcoming BYOB pizza place with calzones that definitely rival the ones I had in New York. The calzones are made to order and are totally delicious. 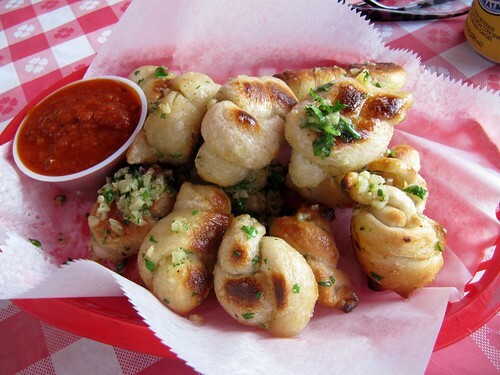 Garlic knots – fried knots of dough with plenty of fresh garlic, parsley, and coarse salt. I could imagine coming just for these, they are so good. A classic deep-fried calzone filled with mozzarella cheese, ricotta cheese, and prosciutto. These are HUGE! You can also get the other calzones fried – I also recommend the spinach calzone, the one we had was stuffed with tons of whole-leaf baby spinach. 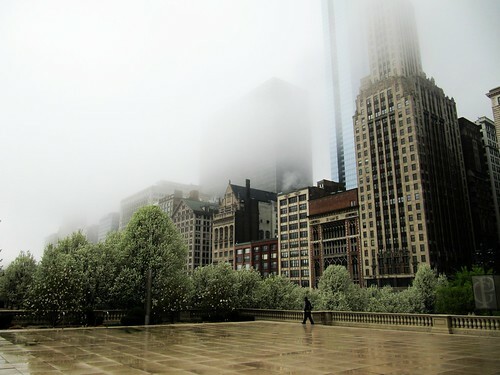 It was a foggy but unusually warm weekend in Chicago. 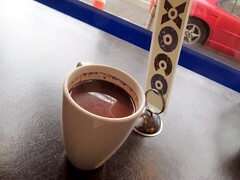 Our flight landed early in the morning; a quick train ride later, we were downtown and walking to XOCO for the perfect rainy day breakfast – amazing drinking chocolate and churros. I had the Aztec (fresh-ground chocolate + water + chile + allspice) while J had the Champurrado, a rich and thick chocolate thickened with corn flour. We walked around for hours. 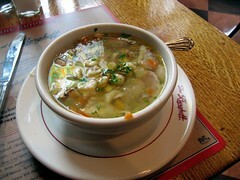 Soaked with rain, we decided to stop in to Berghoff’s for a warming lunch before the Art Institute. At the Art Institute, we were lucky to catch a free talk on Joseph Cornell (the museum has quite a few of his famous boxes). Among other sights, I loved the surrealist art in the Bergman collection, the Claude Cahun photos, and the Thorne miniature rooms. What a great museum. 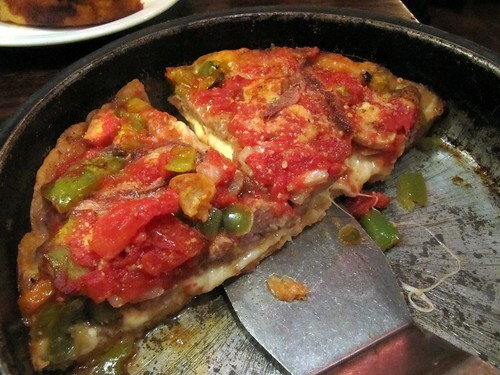 We ended the day with my first real Chicago pizza – Lou Malnati’s. It was as good as I hoped (or better). 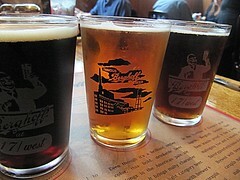 This was the first time they’ve held a tasting, and it was a huge hit, so hopefully it’ll happen again next year. I really appreciated the choice of uncommon and interesting foods. The dishes represented 16 different regions of Germany. 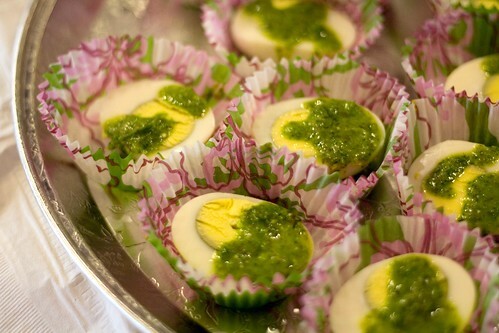 Eier in grüne soße (eggs in green sauce) from Hesse. The green sauce is bursting with fresh herbs. Bread soup – doesn’t sound like anything special, but it was absolutely delicious! Some of the other dishes included three other soups (potato/shrimp, white bean, green bean), potato salad, pretzels with obatzda (a cheese spread- also a favorite of mine), Spreewald style sweet pickles, herring dip, quark spread with pumpernickel, plum cake (my contribution), and stollen. A large beer and wine selection accompanied all of this food – we had a couple of German beers on draft and toasted with a glass of Heinz Eifel Eiswein. 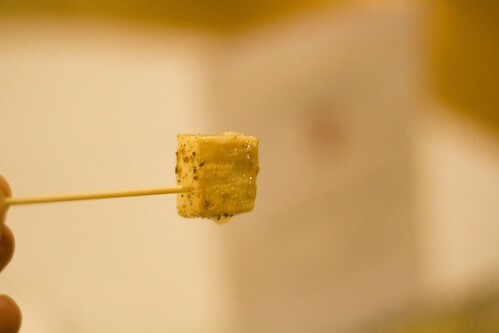 You can view the rest of my photos from the tasting on Flickr. 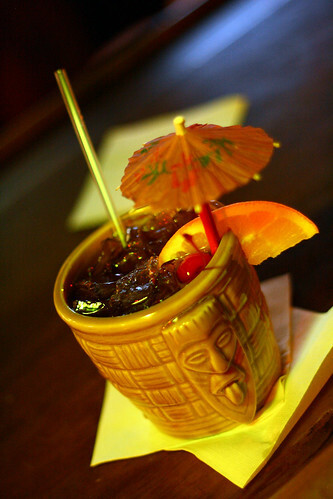 When we were in Tucson I dragged (I am not exaggerating) my husband and parents to Kon Tiki, an untouched 1963 tiki bar. We weren’t even in the mood for a drink, and man were those drinks strong! But I wanted to bask in the Polynesian surroundings and leave with a tiki mug. This one was especially cute. 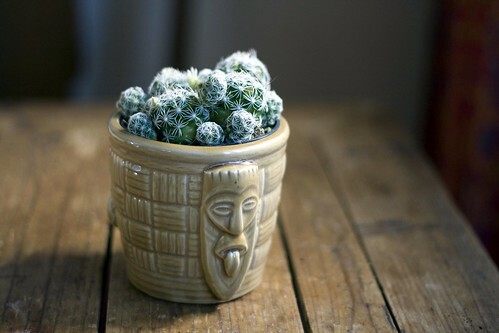 Its current content, also a perfect Arizona souvenir, is equally likely to put some hair – ahem, spines – on your chest. I’ve been to Tucson, Arizona probably twenty times, but only had my first Sonoran hot dog this year. And then I had another. 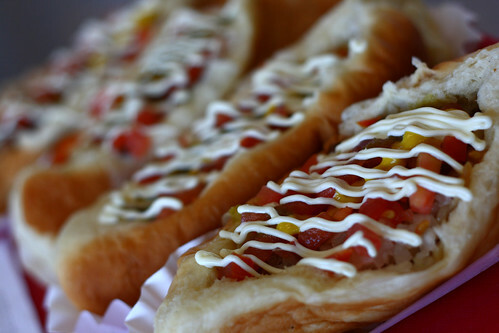 The Sonoran style hot dog is wrapped in bacon, placed in a soft and sweet Mexican bolillo roll, and topped with chopped tomatoes, onions, pinto beans, shredded cheese, ketchup, mustard, mayonnaise, and sometimes jalapeno sauce. The roll is not cut all the way to the ends, and the hot dog is small enough to fit entirely inside, making a perfect container for the numerous toppings. 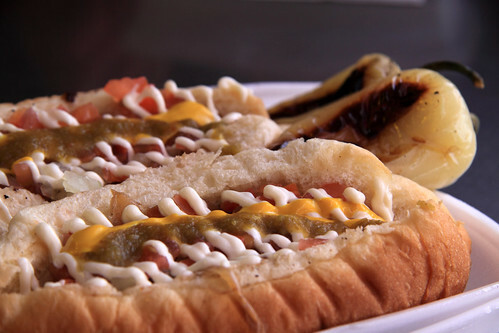 Our first was from El Guero Canelo, which started out in 1993 as a hot dog cart. Their building reminded us of an airplane hangar – spacious, lots of metal, very clean. We loved the fixings buffet, which featured giant grilled spring onions and grilled hot peppers, jalapenos maybe, that had our mouths on fire. Our second was from BK Carne Asada & Hot Dogs. It was a nice day so we took advantage of their outdoor seating. Our order came with grilled peppers on the side. They also had a fixings bar which had an interesting roasted pepper salsa. We washed down each of these hot dogs with horchata, which J cleverly noted is the Arizona equivalent of the classic Rhode Island gaggers / coffee milk combination. Which was better? It was a close call! I very slightly favored the BK dog because the bun was sweeter and softer, and the dog was grilled perfectly – maybe it’s the mesquite they use. 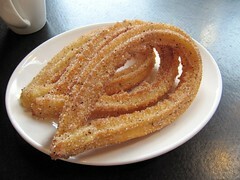 But I preferred the fixings and horchata at El Guero Canelo, and my dining companions preferred their hot dog. I recommend trying both and deciding for yourself.